It is very simple, as the American Wind Energy Association puts it, “while many other countries have wind projects installed in offshore waters, the U.S. does not yet have any offshore wind projects.” Looking at offshore wind energy in Europe, the European Wind Energy association puts “total installed offshore wind power capacity to 2,396 MW as of 30 June 2010.” When the total available offshore wind energy is looked at in the United States the National Renewable Energy Lab reports that there is a “total gross wind resource… estimated at more than 4,000 GW, or roughly four times the generating capacity currently carried on the U.S. electric grid.” That is 4,000,000 MW of power. How is it being used? Offshore wind energy has the capability to replace coal as our main energy source. Just replacing coal as an energy source in the United States will eliminate a total of 1876.8 million metric tons of carbon dioxide per year as of 2009 (USEIA). Coal provides only about one half of the energy used in the United States. So if we have 4 times the electrical power we currently use, available offshore, then offsetting the energy input from coal will only ‘use up’ about one eighth of the offshore wind resource. But we will never ‘use up’ our wind resource as long as the sun keeps shining. There is one large offshore wind farm ready to go. 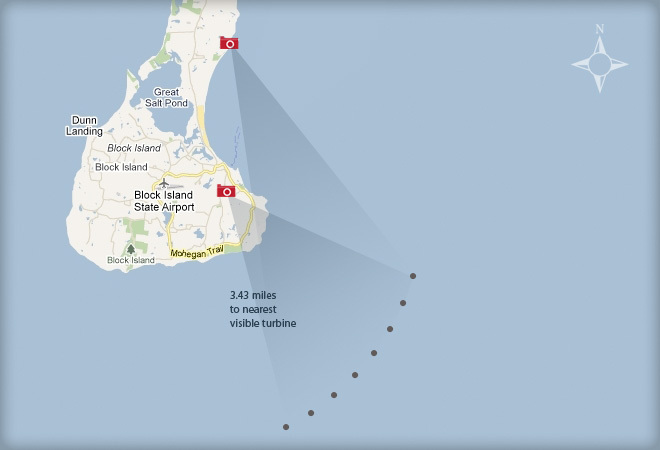 Off the Massachusetts coast, a wind farm is now permitted and ready to begin construction. This one project will be the critical step to moving the US away from burning things to make energy. Why should we as a nation change our source of energy? After the destruction of the Fukushima nuclear power plant this spring, it would be nice to have a power plant that the worst thing it can do is fall on you. Avoiding being smashed by a failing wind turbine is a much easier proposition than avoiding radioactivity or acid rain or global warming. Sure wind turbines make noise, some of it very loud and far reaching, for this we have ear plugs to protect us and ears to warn us of the hazard. Humans have no special sensory organs to detect radiation or acid rain or global warming. What about some numbers for North Carolina, how much power can we make? According to the USEIA North Carolina had over 27,000 MW of power available in 2009. Looking at power plants over 100 MW North Carolina has almost 40 large plants (USEIA). That means they make about 600 MW each. If we placed 5 MW wind turbines, just in offshore locations, 12 would replace one power plant when the wind is blowing. A typical large European wind farm has between 50 and 500 turbines. That means North Carolina would need one exceptionally large wind farm, of 480 turbines, to make all of its electrical power on a windy day. This farm would occupy a square area about 4.5 miles on a side. Think about that for a minute, the National Oceanic and Atmospheric Administration has reserved a 1 mile radius around the sunken Monitor as a National Marine Sanctuary to preserve a valuable piece of underwater history. 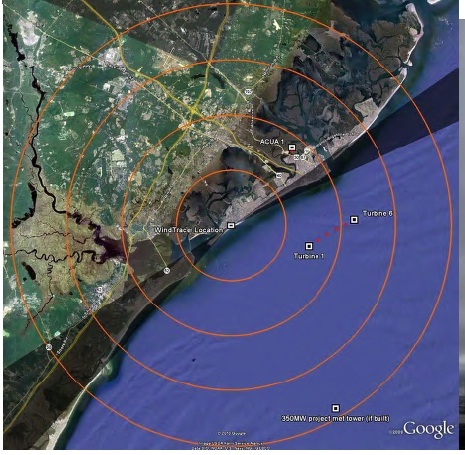 This wind farm would be like having 4 more similarly off limits areas, like the National Marine Sanctuaryoffshore, only the turbines would make energy for North Carolina’s citizens. There is good news however. The US Department of the Interior announced in February 2011 A National Offshore Wind Strategy: Creating an Offshore Wind Industry in the United States, which pursues the deployment of 10 GW of offshore wind capacity by 2020 and 54 GW by 2030. It is good to have a plan, without which market forces would seem to preclude wind energy as to expensive. Furthermore, in February the DoI has started defining Wind Energy Areas or WEA’s, these areas are designated as “implementing a comprehensive, expedited leasing framework for Atlantic wind.” These WEA’s should reduce initial cost for offshore wind energy developers and speed the installation of functioning turbines. The sites chosen all have a wind power factor of at least 5, or 500-600 Watts per square meter at 50 meters height, and are close to major centers of population. There is even a special division within the DoI called the Bureau of Ocean Energy Management, Regulation and Enforcement (BOEMRE). In April BOEMRE approved a Construction and Operations Plan (COP) for Cape Wind, this should be the first offshore wind energy farm in the US, located offshore of Cape Cod Massachusetts. 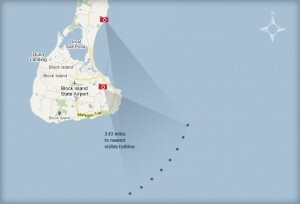 Construction of the Cape Wind project will begin as early as fall 2011. With the beginning of the first offshore wind energy project in the US we have a chance to learn a very important skill. Wind energy production is best installed in a windy location, and the equipment is best if it has excellent aerodynamic properties, to catch the wind. Hopefully the Cape Wind project will provide lessons on logistical planning that can aid more projects in coming online faster and at less cost. Layout of Fishermen's Energy pilot project. For more information see these links: EcoGeek and Fishermen’s Energy. What wind energy lacks, is constant energy output. Right now we do not have a way to store 500 MW of power easily and then return it to the electrical grid with ease. This will limit wind energy to providing only the variable power that represents the daily swings in human activity, and the changes in temperature that influence where we set our thermostats. There are many ways that wind energy can be used to store power for later use. Right now we have available large scale chemical batteries, flow batteries, pumped hydro electrical and underground compressed air. There are other ideas also, the wind energy can be used in industrial processes to make energy storage medium. Think liquid air products or “syn-gas” as easy ways to give wind energy a shelf life. Your style is very unique compared to other folks I’ve read stuff from. Thank you for posting when you’ve got the opportunity, Guess I’ll just bookmark this blog. Matt, it is really interesting to read this post (from 2011) in 2016 and see what has changed in the wind energy field. Although the alternative energy industry as a whole has grown exponentially, we have seen comparatively little progress in offshore wind development. Several of the projects you mentioned – the wind farm highway from South Carolina to Maine and the Massachusetts project – failed to get off the ground and enter construction. Fortunately, the Block Island project was successfully funded and construction is currently underway. The primary challenge facing the offshore wind industry is simply the cost of manufacturing, shipping, and installing structures. Offshore wind turbines are approximately 50% more expensive than land-based wind turbines. Because offshore wind projects are so expensive, they are an inherently risky investment and investors are less likely to provide capital for a project to get off the ground. The only feasible method of funding currently for an offshore wind farm in the United States would be a significant federal or state-level subsidy to entice developers to tackle a risky project. An example of a state that has gone through this process is Maryland. In 2013, Governor Martin O’Malley finally passed a bill that gives successful offshore wind developers a $1.7 billion subsidy over 20 years. Recently, the company US Wind has begun planning a project to take advantage of this subsidy. They are proposing to build a 500 MW wind farm off the coast of Maryland. It is hard to be optimistic reading about proposed projects such as those after reading through your post about failed attempts in the past, however. Only time will tell whether the US can start to capitalize on the energy capacity of winds off of our coasts. One major development since your blog post is the Iberdrola Wind farm in Pasquotank County. This wind farm is right near the coast in northern North Carolina, and is currently under construction. I had the chance to visit the wind farm a couple weeks ago and it was very exciting to see foundations being built and concrete being poured.